The studio is located in the sous terrain of the building. 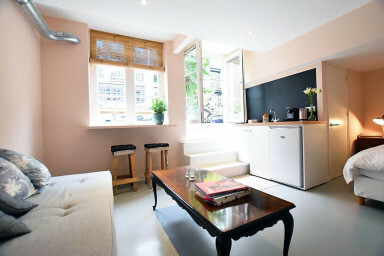 It is a really love house in an authentic Amsterdam style. The whole area is very relaxed with all homes in the same style. If you looking to do some work on your laptop, the bar on the window is a great spot for this. But judge is yourself! You have access to the whole studio with bedroom, bathroom and living space. The owner lives in the same building! We will let you in, hand you the keys and show you around in the house and if you like in Amsterdam. After that you can always call if you need any assistance. Oud West is close to the city-centre and close to both Vondelpark and Rembrandtpark. Ten Katestraat market is an excellent outdoor market with its charming cross-street ‘Bellamystraat’ giving the area an old-fashion village vibe – complete with dance studio and blacksmith. Kinkerstraat is a multicultural area with a large shopping street filled with bars, restaurants, clothes etc. It’s criss-crossed with commercial streets, including Overtoom which has become a major interiors boulevard. Two of the city’s more interesting alternative cultural complexes, OT301 and Lab111, which both mix music, film and art, are located here. But for a real taste for the relaxed diversity of this neighbourhood, visit the sprawling terrace of Du Cap to truly witness all walks of life. And again: the whole city is pretty much nearby. Tram 17 goes right around the corner and will bring you to the city centre in no time. There is a small kitchen, but be aware that there are no cooking facilities! And very important: a coffee machine! The bed itself is king-size!